1. As a class, we will start by watching the Disney Propaganda Film "Education for Death." Students will have to come up with some questions about "Totalitarianism" based on viewing this clip and their background knowledge. We will use these questions to shape our upcoming lecture. Items may be added to the lessons below based on student curiosity and questions. -Students will write down their questions and submit to Mr. Fitton, so he can shape the next few days around those questions. How Could this have happened? Why did it happen? How was it carried out? Why did people submit to totalitarianism? Did people resist? What was accurate about this film? What is inaccurate? How did Hitler rise to power? What conditions allow totalitarianism to flourish? What happened to those who resisted? How did teachers become indoctrinated? Could Totalitarianism happen today? What if you lost your birth certificate? Which names were banned for Kids? Did people not see that Top Nazis were not Aryan? *Did Nazi's think they could interest kids with their cartoons? * Were women as brainwashed as men? *Were same methods used on women as men? *How could people follow a totalitarian leader and do such things? *Why were people ok with book burnings? Why didn't other countries step in? *Why would parents be ok with their children worshipping Hitler? *It Society going towards totalitarianism in the future? *Is Propaganda different between Hitler and Stalin? *How could people support a person like Hitler? *Why do people take lives and use the excuse that it is bettering a country? *Can Totalitarianism be used in a positive way? *Why are the "Unfit" taken away by the State? *Why were the children taught Hostility and lack of remorse. *What was the earliest demonstration of Totalitarianism. *Why did the Government control parent's naming their kids. *Why was Germany so hard on the Children in education; why punish them if they get a question wrong? *Why use totalitarianism and not another type? *Why would couples have to verify with the government the name of their child? *Were kids not allowed to speak their mind in case it was their thoughts or questioning the ay the Nazi party runs Germany? 1. Teach Students March - a warmup to class. - Explain significance of Hitler salute and other rituals. -In class, get students to stomp their feet under their desks, but not in unison. Point out that it is a cacophony of sound. -Then get students to stomp left, right, left, right at their desk. See how they start to get in unison and if one person speeds up, they will all speed up. -Discuss how during times like the depression, people want to follow someone, they want to belong and have an identity –they give up freedom for security. 2. Teach class as an authoritarian teacher. Desks in rows. Students sit up straight. No talking, no moving. Random kids get kicked out. 1. Ask the class the question "Where does Evil come from" "How is Evil able to prosper, like it did in the 1920s, 1930s and 1940s in Italy and Germany." -As students watch this video about "The Psychology of Evil" they have to come up with questions relating this video to the concept of totalitarianism. Must come up with five probing questions. (1 per row). Discussion of what makes a good question first. 3. Must determine what Zimbardo thinks is the root of evil. Is it different from what people think? Is it different from Conventional wisdom. -This video is meant to help us understand the atrocities that occurred in World War 2 and to help us understand how totalitarianism is possible. -Also to note that atrocious exist today as well - Abu Ghraib. 4. Go over unit Matrix on the concept of "Totalitarianism." Each row of students has to come up with a probing question at the end. -Students must create a short answer question and an essay question on the rear of their concept matrix. -Ask students which factors make totalitarianism possible; what do you need; what are qualities of it. As a class we came up with a list similar to this one. Below is a video of the Lecture information on Totalitarianism that Mr. Fitton taught the class. If you are away, please get the handout that has this same information on it. Click the video below to learn about totalitarianism. Please note, you may need to fill in some additional information on your sheet since some of it is only contained on the whiteboard. See below for 11 X 17 handout of the Matrix. Can print in any size. Lesson 2: Appeasement: Revisiting the Legacy of Chamberlain and Daladier. Horrible History Report. (good review of the entire war) - See if a student can access this since youtube no longer allows it. 2. Access Prior Knowledge about appeasement. What do students already know – put on the board. 3. Powerpoint presentation on appeasement. Students take notes. After taking notes, students should come up with possible questions that could be asked on a test. As with Cornell notes, the next day, briefly review the notes and write a 2-3 sentence summary and add your "Cues" to the left side of the page. Below is a comedic rendition of Neville Chamberlain and the "Peace in our Time Speech." It is intercut with actual news footage. To the right is the full uncut version, which drags a bit. 5. Students are to complete the Appeasement handouts and assignments. We will have 40 minutes of class time. Due in two days. Copies available in class. 6. Poland and Blitzkrieg - Powerpoint Presentation. (With imbedded video clips - see below for clip from Fawlty towers). 6.5 ACTIVITY: Reenact a variety of types of warfare, from Roman era, to medieval, to battlefield warfare, to trench warfare, to Blitzkrieg. Get class to re-enact and show what they know. Can do so by taking students outside, or by getting them to line up in class. 1. Read Page 159-161 of Howarth as a class. In a circle. Churchills famous speech. Discuss the power of oratory and how Churchill was able to use Radio (think about fireside chats with Roosevelt) to galvanize the nation. Hitler Dancing Video - When Hitler invaded France, he was so happy he did a little funny gesture/dance. See below for vids. 1. View Slideshow below on the Miracle at Dunkirk and on how Hitler defeated France. Fill in notes. 1. Notes on Package Sheets. 3. Work Time: From notes so far, create 10 True or False Questions for an upcoming game. They can come from any material we've studied so far. Use notes package for sure. See below for two videos that reveal Hitler's reaction to the fall of France. The third one is just funny. 1. Spend ten minutes filling out the Review Sheet from what we've learned thus far. Serves as a great into the The Battle of Britain. 3. Watched any missed missed sections of "Blitzkrieg to the Bomb"
5. Video in the ppt of the RAF - see below from "Horrible Histories." 5. Work on Appeasement Package. Contrast with Hitler "Don't wake the Fuhrer" clip from Horrible histories. (Puppet show, skit, tableaux, 4 line rhyming poem, 5 Newspaper Headlines, A picture drawn and annotated, News bulletin acted out). 3 Notes on Barbarossa – Put around the room. Students copy down the info and then do lecture so they can pay attention. 3. Students get 20 minutes to complete the quiz. When done, they will be collected. 5. Let kids see their quiz grade, then submit to the teacher. 6. Play video clip from Enemy at the gates. ​Explain how it is a video of the type of fighting in the Battle of Stalingrad. 7. Open up PPT below on "Barbarossa"
Go to slide where we finished last time - students are to take notes on that slide onwards. Students have a note sheet to fill in the blanks. Within the slideshow are some video clips. Please note, that links to the video clips therein are also down below this writing. 9. Play “Battlefield Detectives” - Good review from the History Channel on Stalingrad. 3. In groups of two, Students must make up 5 true or false questions about the lecture. Must submit to teacher on a piece of lined paper. (10 mins) STUDENTS, also create an answer key on the back, so that when another group gets their questions for review tomorrow, they will be able to check their answers. 5. 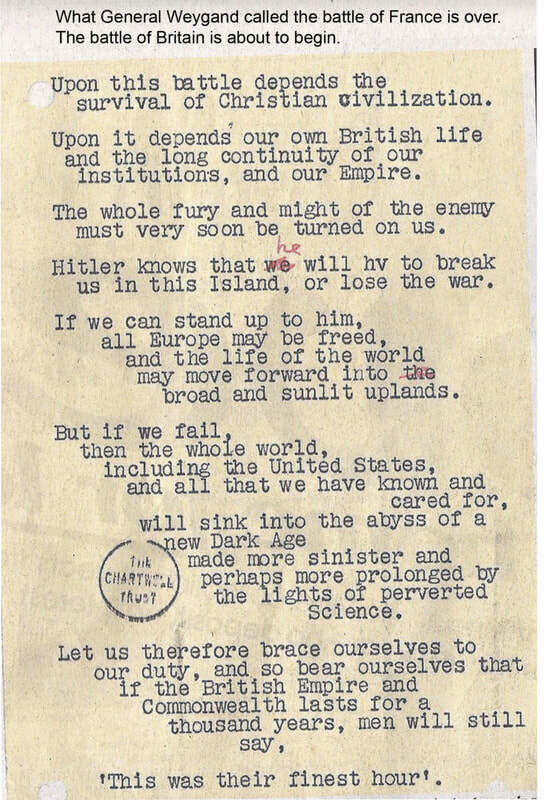 Can start lesson on Battle of the Atlantic - see below. If done early. 6. When 5-7 Minutes remain, hand back their Rise of Fascism Projects which are marked. 1. As a review activity, the teacher will hand out the True of False questions created by students about Operation Barbarossa and North Africa lecture. GAME: Battleship True or False. Students are given a "Battleship Grid" (see below) and are to play according to the instructions. Teacher will explain that today's lesson is about the battle of the Atlantic. 2. Show Two video clips from U571 - Explain the history behind the clips. What do they think of the USA taking credit? (Highly Inaccurate: it was actually Britain (members on HMS Bulldog) who captured the Enigma machine from U-110 in the North Atlantic in May 1941.) However, the director/producer changed it to an American ship. The British Prime Minister at the time the movie came out admonished the company and was outraged. 3. Powerpoint and notes on Battle of the Atlantic. Students need to Finish up up slides 5-the end. Students have their own note booklets. 14. Explain that we have looked at the Atlantic, now we will move to the Battle of Pacific. Tell students that Mr. Fitton will let them finish their game of Battleship Tomorrow. 5.5 - Or play "WW2 from Space"
6. Distribute "Battle of the Pacific Questions" to start working on. 7. Give 30 minutes to work on it. Quiz near the end of the unit on those questions. Must be done first page after 30 minutes (minimum, must keep going if done) leave class. Will move on to "Italian Campaign Lesson" after 30 mins. 5. Work on second page of Battle of Pacific Questions. Small quiz next day (open notes - you get any of the questions you have done; no textbook, phones or any other source - just the question sheet.) (25 mins max, if students are on task. Quiz tomorrow on the two pages. You are allowed to have the question sheet, nothing else with you while you do the quiz. 2. Correct Quiz; submit to teacher. 4. PPT: Notes on D- Day. Throughout the Powerpoint there are several videos. The Downfall is a German Foreign film which captures Hitler's last weeks in power. Powerful acting coupled with excellent History makes it a phenomenal film. Students can bring popcorn and snacks. Only those who have finished work and are up to date may watch the film. Below is a preview so that you can take a look. Famous Scene from "The Downfall" where Hitler learns that the war is going poorly. Bruno Ganz plays Hitler and his acting is so powerful that it has spawned countless internet parodies. Ganz mentions that he is more famous from the parodies than the film. Below is a parody of the scene with faulty subtitles. It makes fun of Chuck Norris. There are hundreds of other parodies on youtube. Most are inappropriate for class. 1. Review film “The Downfall” as a class. Any questions they might have. Guide discussion with questions about cinematography, acting, lighting, music. -Probe for how films like this provide a greater understanding of the History of the Era. 2. Introduce the Parody Assignment - Student work time. 1. Begin with Pearl Harbour Attack: From film "Pearl Harbour"
3. Island Hopping Desk Game. Try your luck at Island Hopping. In class, we will simulate the concept of "Island Hopping" through a game using our desks. We will also watch part of a documentary called "WW2 From Above"
1. Each student in class receives a card with or without a dot on it. Reason to be explained at the end of the class. 2. Holocaust Lecture PPT. This powerpoint is in some ways meant to mimic the term paper that students will be writing. This powerpoint takes the form in some ways of a term paper. It takes a contentious topic and explains that there are two views about it. Then provides evidence and weighs both sides. I will let the class come up with a conclusion. (Discusses the Functionalist/Intentionalist debate concerning the holocaust). 3. Band of Brothers - "Why we Fight"
4. Any questions from the class. 1. Students will get into groups of three. 2. We will view an example from a previous year. See the video to the left. 4. In Groups, students will summarize the 15 key points from the lecture/notes by writing captions below Hitler's Angry Rant to reveal their understanding of the key points from the notes. Students must also about 2 key significances of the event on History. 3 points assignment for equal input and team work, as decided by the group. 1. Re-read the section of notes. 2. Determine the key points needed to understand the event. 3. Determine the significance of the event to history. 4. Begin to write your captions in iMovie. 5. You will have 2 hours of class time to complete all of those tasks and get ready to present. 6. Select the best two minutes of your project and write on the board - we will not show the entirety of every project as the class would easily tire of seeing the rant for an entire block. 7. As a class, we will view the projects in chronological order. A Couple of Humorous Videos That We May Examine! Article on Dutch Resistance --- Students are to read and highlight the three most important facts and one question they have. Then, they partner up and go for a walk around the field where they share the three things they came up with and why they chose them. Then they also pose a question and see if the partner can answer it. Switch. Repeat. Come back to class. This helps give us some background for our guest speaker who was a member of the Dutch resistance.